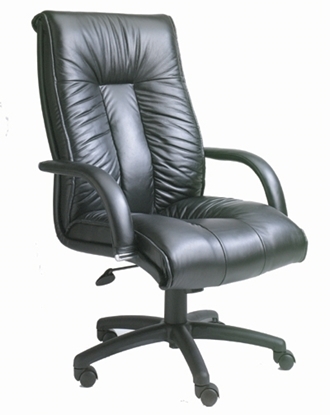 Our leather office chairs are very popular. These chairs breath well and are easy to maintain. Shop quality leather chairs at an affordable price. 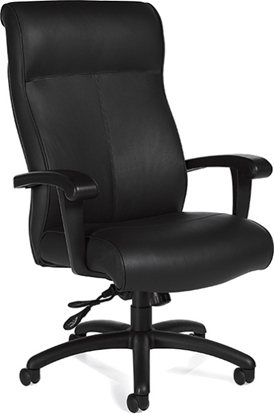 Add comfort to style with this black leather chair that works well with an executive desk or home office workstation. Featuring a pneumatic gas lift, tilt tension control, and an extra layer of padding for additional comfort. A good value at an affordable price. Order today and get free shipping! 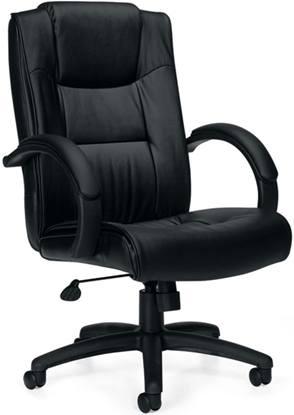 One of our more comfortable executive models, this black leather chair is upholstered in Black polyurethane infused LeatherPlus for added softness and durability. It is available with a Mahogany wood accent finish. Order today and get free shipping! 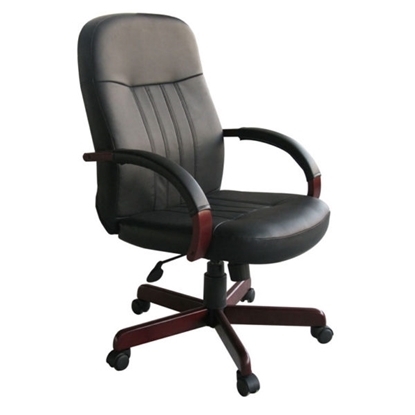 An executive chair that can be used at home or at the office. This chair features built in lumbar support, mahogany base and arms, and is upholstered in leather. 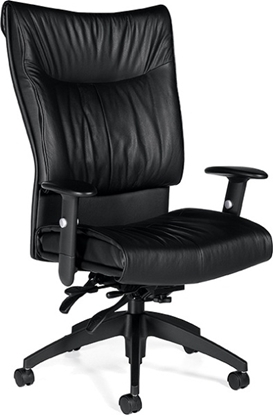 Beautifully upholstered with imported Italian top grain leather, the Boss B9301 chair offers style and comfort. 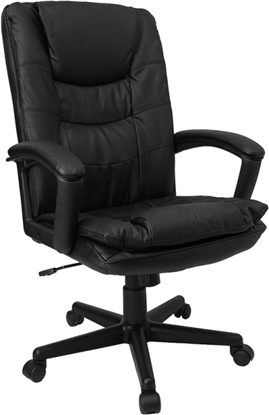 This model is designed with executive high back styling, extra lumbar support and adjustable tilt tension control to provide constant comfort throughout the day. Its look and comfort make Softcurve a prestigious choice for executive and managerial offices. 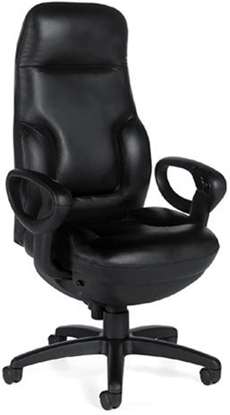 The Global 4697LM-4 Black Leather Chair features a mid back design, aluminum base and leather upholstery. Its look and comfort make Softcurve a prestigious choice for executive and managerial settings. 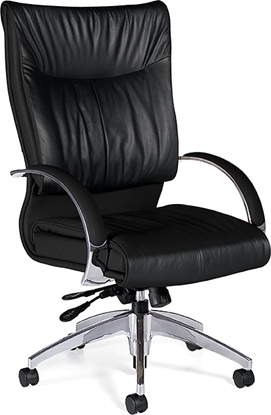 The 4690LM-4 is a high back chair with Black leather upholstery and a modern looking aluminum base. The Global Auburn is a versatile transitional styled chair that can be used with contemporary or traditional furniture. This eco-friendly leather chair offers a number of leather/mock leather combination colors. Made with the environment and comfort in mind. Get free shipping when you order today! Aspen is a fully-featured office task chair that delivers superior ergonomics, affordability and contemporary styling. 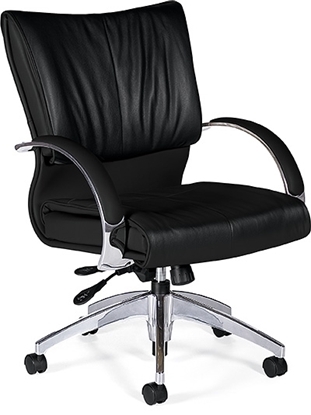 This mid back leather chair provides the comfort and breathability of leather with excellent lumbar support. It accommodates a wide range of users with its form fitting back. 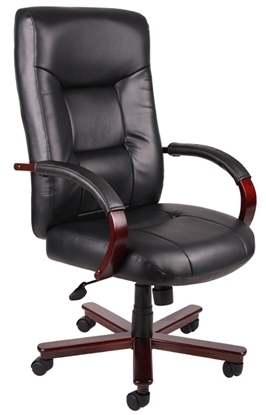 The Concorde executive leather office chair is one of our most high tech and eco friendly chairs. The push button adjustments are mounted on the arm for convenience. Set the back tilt in many positions. Heavy duty weight capacity of 350 pounds. Featured in Black but available in fabric on special order, contact us for details. Get free shipping when you order now!